The March of Dimes’ mission is to improve the health of babies by preventing birth defects, premature birth, and infant mortality. We help moms have full term pregnancies and healthy babies. 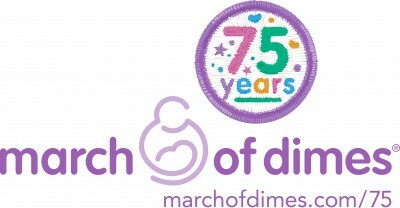 The March of DImes was established in 1938 and recently celebrated our 75th Anniversary. We want to let everyone know that more than 4 million babies are born in the United States each year and the March of Dimes has helped each and every one of them through our research, education, vaccines and breakthroughs. We are also hard at work on the next big breakthrough – finding a way to effectively prevent premature birth, which affects 500,000 families every year. Current Projects/Needs: The March of Dimes is currently investing 3.6 million in Pennsylvania, funding research throughout the state to improve the health of babies, and education for doctors, nurses, and families to work towards the day when all babies have a healthy start.